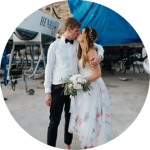 “We had David & Carla as our wedding photographers in September, they came to Moraira for our ceremony and wedding party! They were fabulous from the first time we contacted, friendly, warm and understanding of what we were looking for! They became part of our wedding party on the day, they captured the most intimate and wonderful moments of our special day in a relaxed way. Their attention to detail was beautiful and I can’t stop looking over the photos, the wonderful little extras that came with everything we received was so personal and shows how proud they are of their work and of course how talented they are!